The plant Salicornia europaea is cultivated for oilseed and as a fodder crop in various parts of the world. Two local populations of the species, in the emirates of Ra’s al-Khaimah (RAK) and Umm al-Qaiwain (UAQ), both part of the United Arab Emirates (UAE), were studied. Both of the ecotypes, i.e., RAK and UAQ, grow in coastal areas on the shores of the Arabian Gulf. Studies reveal that they are different genotypes. The UAQ ecotype starts flowering and maturing one week earlier than the RAK ecotype. The spikes of RAK turn yellow before maturing, while those of the UAQ genotype turn pink during the same stage. Data on different characteristics including plant height, plant dry weight, number of branches per plant and number of spikes per plant of the two populations were also taken to identify differences. 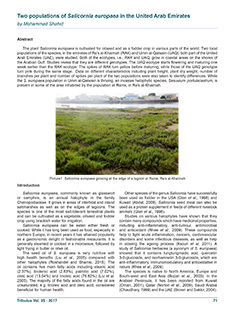 While the S. europaea population in Umm al-Qaiwain is thriving, an invasive halophytic species, Sesuvium portulacastrum, is present in some of the area inhabited by the population at Rams, in Ra’s al-Khaimah.